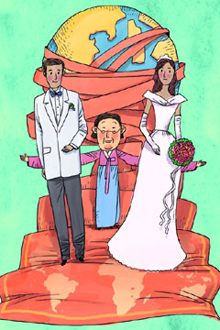 Mystic Korea: Why Korean Men Marry Foreign Women ? Its a big question for every foreigner and student like us , who are always curious about why Korean men marrying foreign women . The main reason Korean men opt to marry foreign women is because they tend to be less picky than Korean women about the educational background and financial and social status of their husbands, a survey suggests. Matchmaking firm Bien-Aller polled 274 single men and 274 single women through its website. According to the poll, 32.1 percent of the men said they felt the biggest benefit of marrying foreign women is their lack of interest in their groom's educational background and financial or social status. The next best reason was their belief that foreign brides would be submissive (23 percent), make their lives more comfortable (15.3 percent), and that the men would not have to get stressed about their in-laws (13.8 percent). Among the women, 31.4 percent said they would marry a foreigner because it would make their lives more leisurely than marrying a Korean. The next most popular reasons were the belief that a foreign husband would be more dedicated to his family (21.9 percent), more mature (17.2 percent) and less picky about the educational level and their financial or social status (12.8 percent). When choosing a foreign woman, the men said skin color is the most important factor (37.6 percent), while Korean women prefer men from advanced countries (28.5 percent). "As the educational and income levels of women increase, both men and women are having a tough time finding spouses," said one Bien-Aller staffer. "Women are more selective when it comes to choosing their husbands, so more and more men end up turning to foreign women, while Korean women have increasing trouble finding Korean men who meet their expectations in terms of education, age and other criteria."